1. Catfish Farming being a Lucrative Business. Nigerian farming startup Premium Aquaculture Limited has targeted catfish and tilapia volumes at 4,500 metric tons per year. The Nigerian farming startup has established two fish farming operations in the country, one in Epe, Lagos State, and another in Abeokuta, Ogun State, which will take off in April this year. Catfish is a high density aquaculture industry, the yield is more than 5000kg per acre. That means pure profit of breeding catfish is generally remained between $900,000-1,200,000 per acre. Furthermore, catfish growth cycle is short, basically in 80 days -90 days, it can culture two quarters a year. Domesticated catfish has the advantage of good nutrition, well processed feed pellets, protection from predators a controlled breading environment and time. Catfish is in great demand and it is consumed as a good source of protein, low fat omega 6 fatty acid and vitamin D.There are many species of catfish ranging into the 100 but just a few will be highlighted bellow. 2. Does Catfish have People that will Consume it in Nigeria? Yes. Nigeria is a country with an estimated population of over 160 million people, and this population is estimated to overtake that of the United states by year 2050. Now what does this mean for catfish farmers? The truth behind this statistics is that there is a ready market for fish and the demand for fish cannot be met by local producers alone. Catfish is one of the cheapest sources of protein and a best substitute for meat. It is a delicacy and can be bought fresh whole, fillets strips or smoked no mater how it is processed for sale catfish farming is very lucrative. Fresh catfish is a delicacy. It is widely enjoyed as catfish pepper soup in homes. Catfish pepper soup is popularly called ‘point and kill’ in bars and restaurants.Fresh catfish is also great for cooking stews. There is also processed catfish. The processing in our farm is a systematic smoking and drying of fresh catfish in brick ovens using firewood and charcoal. The catfish that emerges at the end of the process is a tasty delight. It will transform your soups and stews. You can also use it to cook jollof rice, beans, yam porridge and other meals. Expectant mothers love pepper soup cooked with dried fish. Some Nigerians even use the processed catfish to drink garri. Olawale Tajudeen, the chairman of the Catfish Farmers’ Association of Nigeria (CAFAN) has urged youth to engage in fish farming, calling it a ‘lucrative business’, and under the federal government’s scheme 760 farmers have benefited. Delta state government in Nigeria said four big fish feed factory is under construction, the project is expected to cost 550 million naira ($3.4 million). Four major fish feed producers are Ubeji fish feed Co., Ltd., IKA fish feed Co., Ltd., Asaba Co., Ltd. and Uvwie to feed the fish Co., Ltd., the four fish feed producers are parts of that ten feed factories built by the state government. Industrial and Commercial Association of the Commissioner said that the construction of the fish feed plant will help to ensure that the country’s aquaculture farmers have sufficient fish feed, which help improve the fish production. Commissioner added that the fish feed processing plant has become a necessary facility, because many aquaculture farmers involved in the large-scale aquaculture, feed supply must be sufficient. The state government will soon set up 22 Commodity committees to help the sale of locally produced fish feed products. How to Start a Catfish Farm? As we can see from the first section that Nigeria people’s demand for catfish is beyond doubt. In the month of December 2013, the federal government of Nigeria implemented and enforced a law banning the importation of frozen fish. This move was made to encourage the local production of fish. Now the truth is that the demand for fish cannot be met by local producers alone, so there is presently a market gap waiting to be filled by smart entrepreneurs who can be bold enough to venture into fish farming. Then choose your fish species, the most common species found in Nigeria are: Clarias gariepinus, Heterobranchus bidorsalis, Clarias X Heterobranchus hybrid (Heteroclarias) and Clarias nigro-digitatus. Heterobranchus sp are very common in the south eastern part of Nigeria with clarias spp dominating in the west.Despite the popularity of catfish farming in Nigeria, the fish farming industry can best be described as being at the infant stage when compared to the large market potential for its production and marketing. The volume of capital needed depends on the scale of your proposed farm. The bigger the scale, the bigger the capital needed. Here suggest to you start small and expand as you get better understanding of catfish farming. It would not be a bad idea to start from your backyard container in order to obtain basis of catfish farming through practice. The knowledge obtained can now be transferred to real catfish farming. So, keep your money and learn how to profit through it. The space needed can be leased or bought out-rightly depending on the available capital. The kind of space needed is the one with tangible source of water (borehole, stream, river, etc). Whether earthen, concrete, containers, or synthetic rubber ponds, water is needed on a regular basis. Stock your pond with fingerlings, baby catfish about 4 to 6 inches long. It’s common for catfish farms to stock ponds to a level of 1,500 fish per acre, but fewer fish will need less dissolved oxygen. With a smaller than maximum population, you save yourself the cost of aerating the ponds. After a time, gather some breeding-age catfish and place them in a separate pond to spawn. Select two males for every three females, and keep the population density of the breeding pool between 800 and 1,200 pounds of fish per acre. Catfish can eat almost anything, because they are omnivorous in nature. For greater yield fish farmers should buy ready made feed. The feed comes in pellet form of various sizes ranging from 0.9-15 mm. You feed them once or twice daily. Over feeding can affect the pH level of the water and could kill them, any evenness food in the water should be removed. The pellet sizes of catfish food varies according to the size of the fish it ranges from 0.5 mm, 2- 3 mm, 4 – 5 mm, 6 -7 mm, 9 -10 mm. The grange is starter, grower, grower, grow out. The nutritional properties of the feed are crude protein, moisture, crude lipids min, crude fiber max, calcium max, phosphorus min, vitamins.The feed also contain soya beans,corn, shrimps and protein. The raw material: fish meal, shrimp meal, soybean, yeast powder, strong flour, fish oil, lecithin, special multi-dimensional, trace elements etc. (1)According the fish size to determine the feed type, in order to meet the nutritional needs of catfish in different growth stages. (2)”timing, fixed-point, quantitative, qualitative” should be achieved, and adjust feeding amount according to the weather, water temperature, water quality and feeding condition, avoiding excessive wastage of the feed. (3)If owner want to add medicine or additives, firstly dissolved them in appropriate amount water, and then spray on the pellet, then use them after drying. Cleaning of raw materials before crushing it. Impurities in feed raw materials, not only affect the quality of feed products and directly related to the feed processing equipment and personal safety, serious when can cause the whole equipment was destroyed, affecting the smooth production of feed, it should be promptly removed. The most common machine for grinding is the hammer mill. The pellet size directly effects the efficiency of pellet making. Once feeding into the crushing chamber, materials are smashed under the high-speed rotation of hammers. With the high pressure and rapid-moving of airflow, the smashed raw materials are further reduced into particle size or very small pieces for further processing. There are different capacities of hammer mills for your demands. Screen sizes recommended are as follows: for 2mm pellets, 0.75mm; for 3-5mm pellets, 1.0mm; for bigger pellets, 1.0-1.25mm. Next, place all the ingredients in a blender, and then add about a teaspoon of garlic powder before blending the whole mixture. They should also measure the total yield of the feed mixture using a measuring cup. This allows keepers to know the exact number of pellets they can make out of a specific amount of ingredients. They should then place the mixture in a mixing machine. Owners should take the total amount of feed yielded, and then put 20 to 25 percent of that amount of flour into the mixture. The flour acts as an adhesive to keep the mixture together, and it dries it nicely into pellets. Keepers can use any type of flour, like rice flour or plain flour. At this stage, owners can also add additional ingredients, such as fish or krill meal for added nutrition, and then mix thoroughly. Fish feed extrusion process is a key step, after mixing, feed pellet extruder will compress feed powder into sized pellets. There are 2 kinds of fish feed extruding machine for choose: one is Dry Type Fish Feed Extruder, the other being Wet Type Fish Feed Extruder with a conditioner suitable to manufacture high quality fish pellets in large capacity. 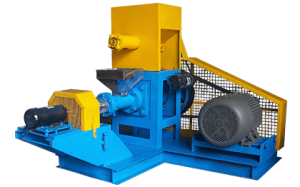 The difference between those two types of extruder: Dry extruder use friction heat as the heat source to make the pellet aging and dehydration. 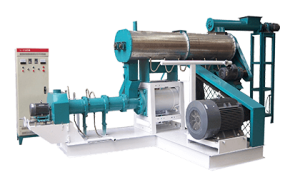 While the wet type fish feed extruder, the raw material should first to be preconditioning, injecting of steam, water and other liquids in the material to make it preheating and curing. The wet type fish feed extruder machine has character of high yield, good quality and long service life of wearing parts. Generally speaking, the service life of wet type is about twice than that of the dry type fish feed extruder. Dry type extruder machine is suitable for small manufacture and fish farm. Final pellets from fish feed extruder are moist in high temperature, the pellets temperature can be 90℃ and moisture about 18%, so they can not be transported and stored immediately and require to be dried first, the temperature must be reduced quickly to ambient and moisture to 8%-12% for storage. Here the mesh belt fish feed dryer is recommended for best drying quality. For acquiring better smell and taste, oil spraying machine can be used to spraying oil to the surface of fish feed pellets coming out of the dryer. To add plam oil etc to fish feed is a very important part for feed production. the animal feed added with oil is looks much more smoother and easy to absorb by animal. Fish feed oil spraying machine is designed to add oil to aniamal feed, fish feed pellet with good result and high efficiency, which has been widely used in fish feed making. Pellet cooling process is often taken for granted in pellet production line. Hot pellets from pellet making machine are still soft and easily broken, which can result in a high percentage of fines. By cooling pellets can be harden. Counter flow cooler is cooling type that commonly used in pellet industry currently with the direction of the air and product of pellets in opposing directions. The fish feed pellets are packaged in bags for further transporting and storage. 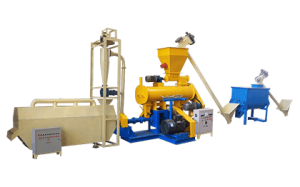 Here you can opt pellet packing machine which is suitable for weighing and bagging pellets. The above processes, the main steps of making fish feed pellets, are suitable for other fish feed production. With quality fish feed extruder and right feed formulation, you can make feed pellets your wanted depending on the production procedure. Fish farming in Nigeria is an untapped goldmine based on the fact that there is an ever increasing need for it as the best alternative to meet the protein need of the people. It is business and there is an opportunity. Catfish grown in ponds are now competing with imported fish.